First of all, you are crazy. Second, Congratulations! 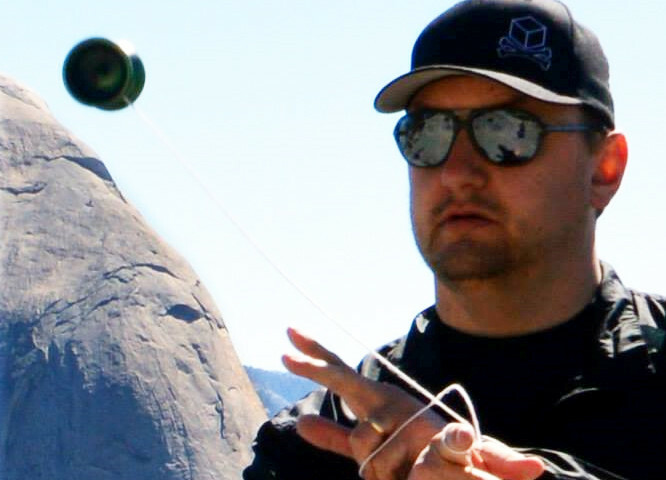 I have some tips from years of California State Yo-Yo Championship organizing and planning, in addition to other contests I have helped run that may help you out! But instead of just doling out tips to every Joe and Sally, let’s make sure you are running a contest for the right reasons. 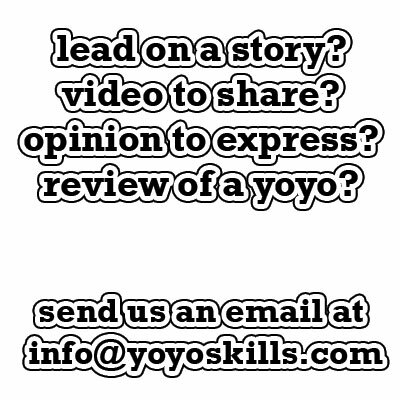 Assuming you are slightly known within your local yo-yo scene (clubs) and within the greater yo-yo community (Facebook Groups, Forums, Youtube, Twitter, Reddit, etc. ), please finish following statement. Using my Magic 8 Ball which I have duck taped to my voodoo rainbow sparkle infused Flores Return Top acquired during an accidental time travel trip to 1920’s New Orleans, I will interpret your response and the success of your future yo-yo related event. Perspective – Event organizers are raking in the money. Greedy $35 entry registration fees, vendor tables commissions, sponsorships, and even the raffle tickets. That guys HAS to be swimming in cash… right? Reality – Wrong. Bad idea. So wrong it is not even close and you should really go find an event organizer and hug them for ever having that concept in your head. The reality is event organizers usually end up GROSSLY under budget and operate out of pocket by the end of the event. They are not raising fees and selling raffle tickets because they want to make more money, they are dancing the thin operational line of “Budget verses Wallet” and trying to lose less money. Here is a sample list of expenses I had running Cal States. This is just a sample mind you. That last bullet covered so many different off the wall needs it’s not even funny. One year I had a large cash sponsor fall though after we published the prize amounts. One year I paid my sound guy more because one of his hardware units caught on fire in the middle of the contest. I wasn’t able to come close to the actual expense of the item but I paid him almost double what I had planned to. My point is that every year I ran Cal States, I left the contest with money in hand but it never actually covered the expenses I already put money out for, and I ran a lean ship. For 4 years in a row, Cal States made profited me exactly zero when you factor in the 8 months of total expenses. Now you could run a contest with no prizes and a huge entry fee and make money that way, but who wants to go to a contest like that? Quickly, without hitting up Google or Yo-Yo Wiki, five event organizers in 2003 for any State or regional level yo-yo championship not held in your own state? You can have “Chris Allen Cal States” as your free bingo slot. Chances are, unless you are naming yourself, or your friend which you helped run it, you can’t name more than maybe three people. 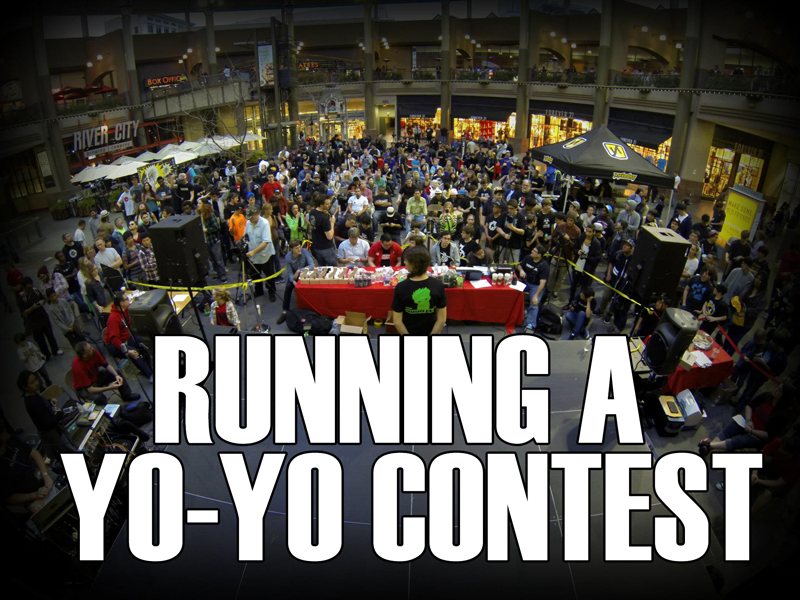 My point is, anyone who is known as a contest event organizer is probably already known within the yo-yo community. You will get a momentary pop in reputation but the yo-yo community very much has a “What have you done for me lately” mindset so don’t expect it to last unless you are already in a public facing role in the community. Most of the time, event organizers are already established names in the community, and are already well known before they run a contest. Think about your area. How big is the yo-yo scene there? When I took over Cal States and moved it to Sacramento, I knew there would be a good showing because the yo-yo scene is pretty big here. I had planted enough clubs and done enough school shows in the area that I knew even if the yo-yo community at large failed to show up, I would have a good turnout. If your area has a thriving yo-yo scene with multiple clubs, then yes, your area could probably support a yo-yo event of some kind. As a former contest organizer and as someone who is relatively plugged in with the “behind the scenes” yo-yo community, I can tell you without a shadow of a doubt, the smartest guys in the yo-yo world have already created the most fair and balanced judging system out there. Is it complex? Yes. Is it hard to understand? Yes. Can it be abused by players? Less and less every year. As it stands currently this is the best judging system we have for the types of contest we run. It is constantly being tweaked and evolved by people with degrees in math, physics, and even a freaking real honest to God former rocket scientist, all with decades of experience in the yo-yo world. Bottom line, you will want to use the current judging system not only because it is well tested and has a proven track record, but also because your contest won’t be a contest without it. Let me explain. 1: Contest are broken into categories. You have a State contest, which feeds to a Regional (multi State) contest, which feeds into the National contest. From here it gets a bit complicated, because there are a few “World” level and multi-national contest like Pacific America Nationals, Worlds, European National, Asian Pacific, etc. Basically, the top end of contests is just a complicated by the bottom end. 2: All of these events are governed by a league. It’s the National Yo-Yo League here in the US. That league in turn is governed by the International Yo-Yo Federation. 3: You want to be part of the chain. To be a part of the chain that “seeds” to the “World” level, you must use a judging system, and fall into compliance according to the IYYF. If you want to prove a new judging system and run a contest not approved and supported by the IYYF, you will have a harder time getting sponsors and establishing contest credibility. Not only that, but pro players who spend their entire year grinding out contests to make it to the “Worlds” level won’t go out of their way to be part of your event if they have to train for a different judging system. If you don’t want to be part of the IYYF chain, you are basically not running a contest, you are running an Event. Not that there is anything wrong with that. We need more events. Events help spread yo-yoing and are good for the community, just be aware what your end goal is and recognize your event for what it is; an event and not a contest. These are all valid reasons, but you need them all not just one. Running a yo-yo contest is a huge responsibility and you should know that going in. You should not go into it looking for fame, fortune, or starting a revolution. You go into running a contest expecting hard work, and costly sacrifices. You will get little recognition if it succeeds and hurt feelings if it fails. If you are okay with this and if you can suppress the automatically selfish human desires for ego boosts, you can run a yo-yo contest. Let me give you a few tips. 2: Make a budget and save 20% for unexpected costs. The total cost of Cal States every year was around $12k, and that included cash prizes. Every year I had unexpected costs but because I planned for it, it didn’t have to come completely out of my pocket book. 3: Start 8-10 months in advance. Not only do you need to book a venue, you need that venue locked down in order to get sponsors. You also need to give sponsors enough of a window to plan for the event. 8 months out, I had a media package in the hands of nearly every yo-yo manufacturer on the planet outlining sponsorship levels, benefits, and costs. 4: When approaching sponsors, always ask for cash. Cash makes the contest happen, but be willing to work with them if they can’t afford it. Lots of small manufactured only have the budget for one or two contests. If they can’t give cash, ask for unique or popular items you can auction off ahead of the contest time to get the cash you need. Any items that don’t get sold can be used as prizes, but most competitive yo-yoers don’t want another yo-yo for winning, they want cash. 6: Arrange tables and space for vendors. Depending on the size of your contest, the vendor tables can be vital to funding your event. A lot of contest organizers don’t like to talk about this but it is not uncommon for contest the organizer to be out of pocket several thousand dollars and the only way to recoup that deficit by the end of the day is for the vendor tables to do well. 7: Seed last year’s winners and whatever contest feeds into yours, but that’s it. It sounds like a good idea to seed any champion from anywhere (or from any year) to your contest, but after a few years your finals will be stacked with seeds and very little openings for non-seeded players. Last year’s champion should be able to defend his title without having to go through prelims, but that is it. 8: Do everything you can to lower your expenses. Your social pool is a resource. Call in favors. Do you know an artist? Do you know a DJ? Lighting? Sound? A yo-yo contest is an all day stage event. You will need more resources than you can imagine. Get volunteers. Work out deals with local groups. For the first few years of Cal States, I did a raffle. A local high school Cheer Team sold tickets to me in exchange for a donation to their Cheer Camp budget. I gave them 50% of raffle ticket sales and sold around 2000 tickets. The money from the raffle allowed me to pay for judges, food for the event staff, and hotel rooms for a few people. Another year I had volunteers from the local Air Force Base to help with registration, and crowd control. These Airman are expected to do community service and all it required from me was a letter of appreciation. Another year I teamed up with a group of Girls Scout mom’s, who in exchange for them running tables for me were able to sell Cookies. 9: Take care of your staff and judges. They should not have a single expense the entire day. I worked with Starbucks to give free coffee in exchange for a sponsorship package. I paid for food, and drinks. I scheduled breaks and every moment I had, I was checking on my staff and judges. At the end of the day, recognize them and if you have the budget for it, pay them. If you don’t take care of them, they won’t want to work for you. 10: Hold your contest on a Saturday, and for only one day and keep prelims off stage. Most people can’t take more than one day away, and every day you extend the contest you multiple your operational costs. It’s hard to keep it all in one day if you have a lot of contestants, so while you are doing the finals for the smaller divisions, do 1a prelims off stage. In 2011 moving the prelims off stage into a back room was vital to keeping the flow of the contest going, staying on time, and having the time to showcase a variety of talent on the main stage. I held Cal States in a public mall with the opinion that people would come and stay for the free show so I treated it like a show. The stage was reserved for the best talent in each division, and I broke up divisions with acts and entertainment, or used the time to showcase important sponsors. It worked so well multiple contests followed suit afterwards. That that you know what you are getting into, do you still want to run a contest? If the answer is yes, fantastic. If you are unsure, maybe you should look at holding an unsanctioned event or a club instead.